Projections of population distribution could be of useful reference in urban planning, which would support effective resource allocation at local levels in future. 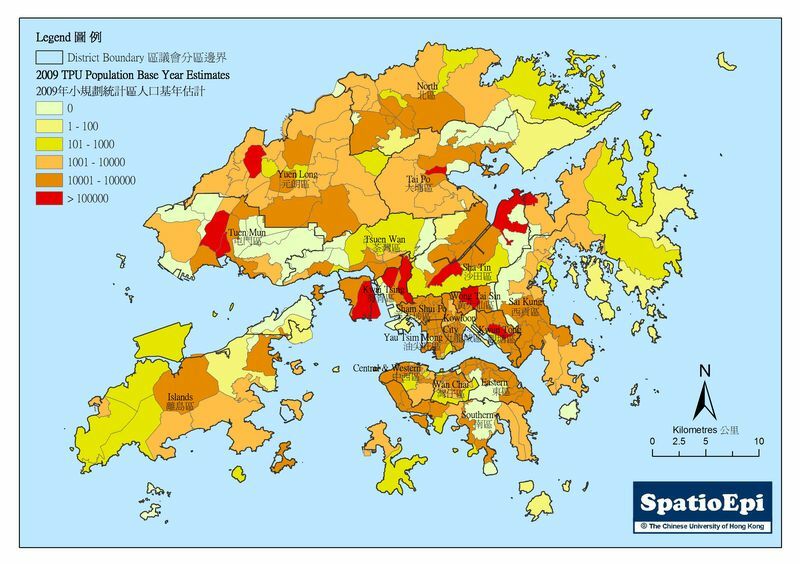 The map shows the spatial distribution of the percentage changes of projected population in Hong Kong. It reflects the pace of urbanization and illustrates the availability of new land for development. The situation is portrayed at 2 levels – the larger District Council district and small tertiary planning unit. 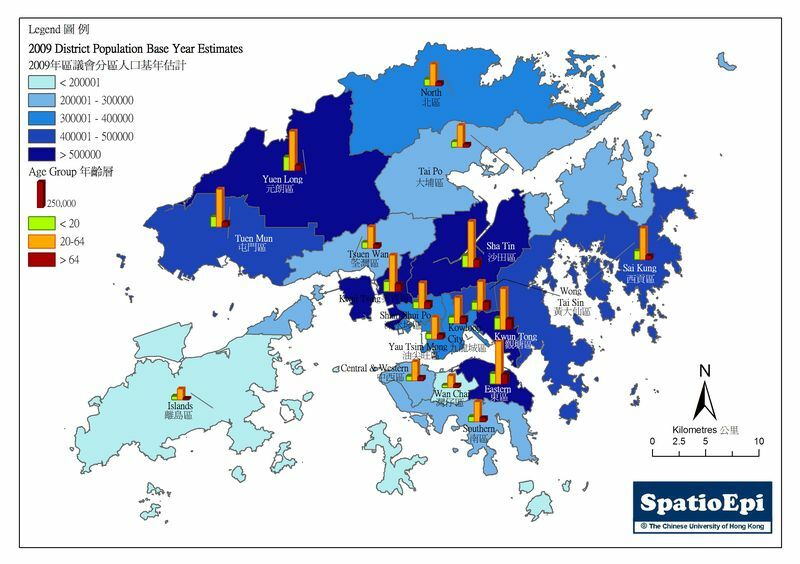 As depicted by graduated colours, Tertiary Planning Units in northern New Territories would experience a faster rate of population growth by 2015. The arrow signs indicate the projected population change for larger geographic regions during 2009 -2019. The population growth is moderate in the urbanized south compared to the north. 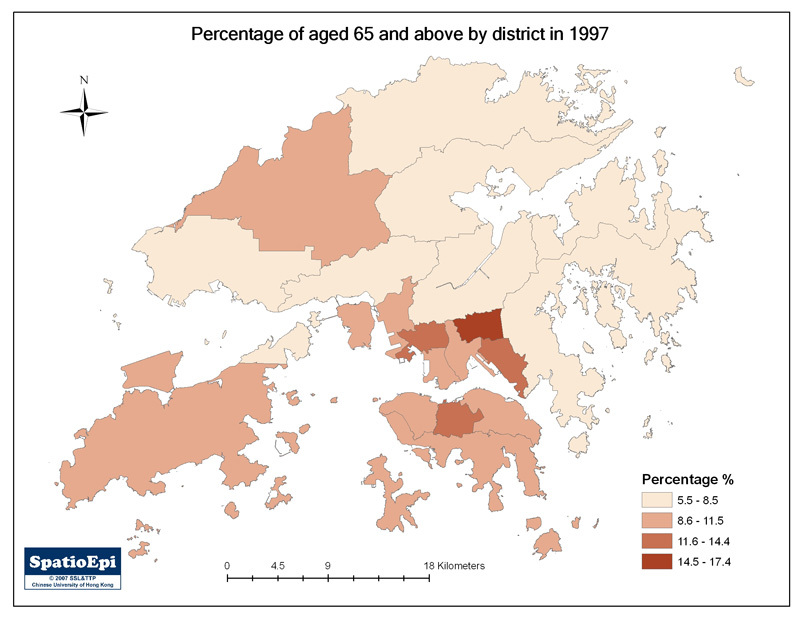 For some districts and new towns with aging population and long development history, such as Wong Tai Sin and Tsing Yi, decrease in population is anticipated. The data for the map was obtained from Planning Department of the Hong Kong Government. In response to the rising population while attempting to improve living environment, the Hong Kong government initiated the development of new towns in the early 70s. Tsuen Wan, Tuen Mun and Sha Tin were new towns of the first generation. Today, new towns are home to nearly half of Hong Kong's residents while development of new towns has continued. Meanwhile, population aging and social problems like poverty are no longer restricted to old urban districts in Kowloon or on Hong Kong Island, but also emerging in some older new towns. Thus, while infrastructure are being laid down for the next generations' new towns, the essentiality of improving community facilities in the existing new towns according to the changing social environment should never be neglected.